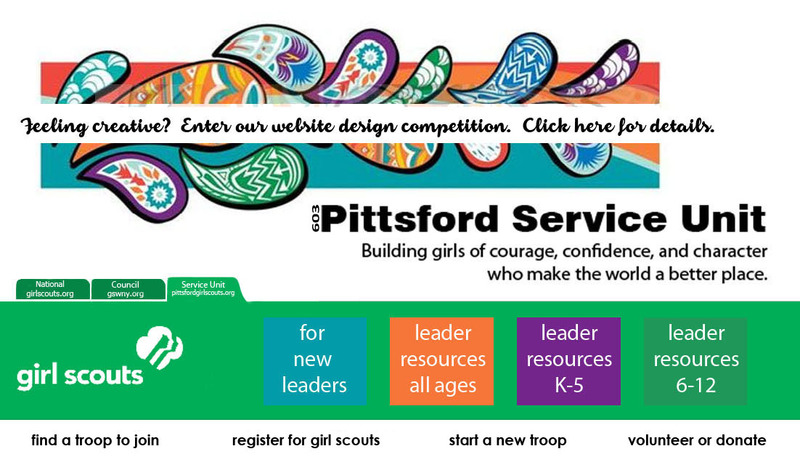 The Pittsford Service Unit is supported by the Girl Scouts of Western NY locally and serves the girls in the town of Pittsford. The Service Unit is managed by a Service Unit Team consisting of leaders and other adult volunteers who coordinate the activities of Pittsford leaders and troops. The Service Unit Team is always looking for new members to fill open positions. Please contact any member of the Service Team for more information. Every troop should have leader and parent representation at the monthly Service Unit Meetings. Leaders and parents can rotate, but every troop should have representation each month so you don't miss out on important information that is shared. Our monthly Service Unit Meetings are held from 6:45 - 8:00 p.m. in the Barker Road Middle School cafeteria. Please check-in at 6:45 p.m. so that we can start on time. FREE kidsitting is available.